Last Wednesday and Thursday, January 23rd and 24th my friend Steve Speckert and I made the trek to McGregor Lake to sample some early ice mackinaw fishing. We weren’t disappointed. Between the two of us we figured we hooked and landed near 80 lakers. Even the smallest would be considered decent fish by most standards. Recent observations by several lake trout fishermen indicate that a mixture of green chartreuse glow and white glow seemed to be the most effective lure. Also I used a 1//4 oz all glow 2” tube jig. It was slow getting it down in the 190 to 200 foot depth in which we were fishing but as with all soft baits the fish have a tendency to hold and devour it more readily than a hard bait. I believe that during the “McGregor Lake Mackinaw Tournament, February 9th and 10th this will be my bait of choice for targeting the larger fish. Last Sunday, Jan. 20, I spent the afternoon at Lake Mary Ronan and had some successful perch fishing in depths near 30 feet using a 2 inch chartreuse glow crappy tube. Chartreuse colored jigs have like wise been the best at Pablo Reservoir which has also been giving up nice catches of perch. Early morning and night time have been best at Lake Mary Ronan for many limits of kokanee. Submersible lights have benefited night time fishermen though they’re not a necessity. 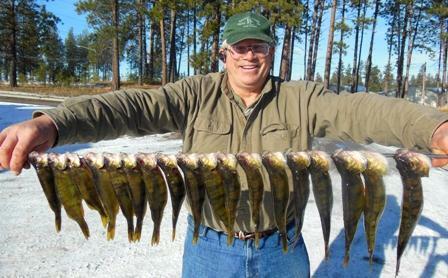 Echo Lake, Hubbard Reservoir, and Bitterroot Lake have had good kokanee action this ice fishing season. 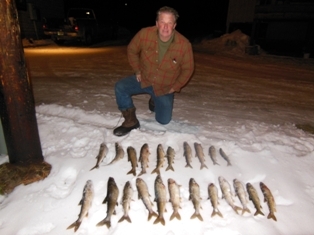 East Bay on Flathead Lake continues to produce good catches of Lake Trout and perch. Whole fish, big tube jigs or sausage being best for lake trout while a 1/8 glow Double Whammy Trilobite will bring in the big perch. We welcome Westland Seed in Ronan as a new vendor for our lures and wish them the best of luck for their sporting goods store. For more information call us at our store-406-675-0068, my personal cell 406-250-0241, or email us at macman@ronan.net. Our website is undergoing a new facelift and upgrades. You can visit it now; however, it is still a work in progress at this time.